A Mysterious new ride is coming to the Wizarding World of Harry Potter. One of the biggest rides in the Wizarding World of Harry Potter will close permanently and Universal Orlando promises a huge new attraction will replace it. In a blog post, the theme park announced only a few days ago it is planning to make a “new generation of thrill ride” in the park. The new ride will replace the existing Dragon Challenge coaster at the Hogsmeade section of the Wizarding World in the Islands of Adventure theme park. 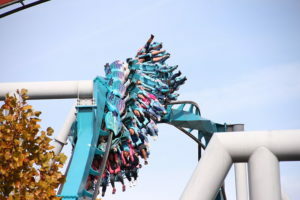 The two intertwined, inverted coasters were original rides for Islands of Adventure’s grand opening on May 28, 1999, and were initially known as “Dueling Dragons.” The attraction was renamed “Dragon Challenge” in 2010 and became part of Wizarding World. Both coasters are 125 feet tall and with 3,200 feet of track, they feature five inversions. The red track reaches a top speed of 60 miles per hour while the blue one reaches 55 mph. In the past, the two coasters used to duel, with several near miss elements throughout their run. However, due to several incidents of riders being hit by flying loose objects from the other ride, Universal altered the train timing to stop the dueling. Dragon Challenge’s last day of operation will be Sept. 4. The theme park promises in its blog that the all-new ride “will take you deeper into J.K. Rowling’s Wizarding World,” and will include some of your favorite characters and creatures. The ride will be unlike anything you have seen before.